Ron Dennis is known for his vision at the helm of McLaren and has recently been talking about Paragon � the team's new and ambitious headquarters, being built around the corner from their current site. 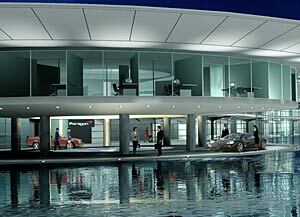 The vision is awe inspiring in concept, and has been non-trivial to implement from start to finish. Conditions of the development include reclaiming so-called "brown site" land � in fact, an ex-rubbish burial site with some rather nasty chemicals thrown in to boot � and keeping the height of the building below the tree-line, in accordance with green-belt building rules. This has ensured the multi-story complex has to be built with sub-terranian levels, running deeper into the ground that it rises above. Restrictions and complications aside, the site is designed to provide the workers with an ideal environment � well suited to dedicated employees, who spend long hours in the office. Amenities are to be built right in, including medical and sports facilities, cleaning and other sundry affairs to smooth the running of busy lives. To quote Dennis, "This will be an industrial Utopia for my workers." He goes on to say, "I am doing it to be better as a company, better as a Formula One team and as an employer. The environment will be so good here that my staff will be itching to get to work. 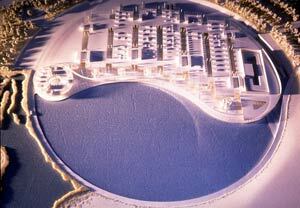 The entire factory will overlook a huge lake, so everyone will have a pleasant view - not just the bosses." Whilst never likely to have the Jordan family "fun and frolics" environment, Ron Dennis and McLaren are doing their level best to ensure they are the best team in the paddock to work for. Following a number of accidents in testing, as teams return to the track, there is a growing concern in the halls of power that safety is failing to meet the standard during testing. One of the side-effects of Twenty-first Century Formula One is its increasing exposure to the public away from the Grands Prix themselves. When the World Championship began in its current form, back in 1950, the circus drew fairly substantial crowds to races, but little news made it to the masses when the fraternity was away from the track. Those involved in the sports knew that testing was all but as dangerous as driving races � the risk of collision with other cars was reduced, but new parts could fail. With the ascendancy of Bernie Ecclestone and his media empire, the sport now impacts countless millions of viewers worldwide, generating substantial year-round interest that in turn ensures the press a healthy return on taking time to follow the sport away from the track. This ensures that significant incidents away from the big screen have become a real source of concern for the guardians of the sport: the image of Formula One would be tarnished badly if a driver was to suffer serious injury - or worse, die - in a testing accident. 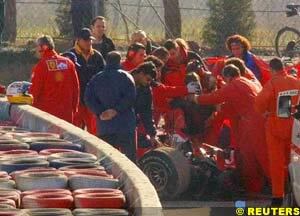 When Luca Badoer's Ferrari lost balance and cart-wheeled over the wall at speed, thousands of sports fans knew within hours that the Italian marque's test driver was in hospital, suffering an unknown malady, having been carried from the wreckage. In 1998, following a spate of rear wings coming off in testing, cars started losing them during races: the BAR of Jacques Villeneuve was a particularly well documented example as he spun helplessly out of the Australian Grand Prix. This is something that Formula One drivers of yesteryear can tell you is not as uncommon as it should be. The incidence coincided with allegations that teams had flexible wing structures, providing the FIA with both the obligation and excuse to introduce the rear wing load test. That the 100kg pull is nothing compared the forces the car goes through at 300km/h was not important: teams got the message and started behaving themselves, increasing tolerances and catching the bulk of would-be failures in the assembly room. However, the quest for speed is relentless, and in a stable rule environment, the biggest improvements for front runners will come from running on the ragged edge for tolerance � Jordan are even counter-sinking their Honda logo to improve airflow over the nose-cone. Any component that lasts more than a race distance is clearly over-engineered and costing a fraction of time. Any structure that bears more than the maximum forces imposed on it, is also over-engineered and is too massive � and probably producing an excess of drag to boot. The rules for 2001 have reduced the aerodynamic load, leading to reduced maximum downforce. This in turn leads to lighter loading on the suspension in high speed corners, so permitting designers to reduce the mass of the suspension components. The more mass is moved to ballast in the chassis, particularly from unsprung components, the better the car can be balanced. The recent high speed crashes from two of Formula One's most experienced drivers � Eddie Irvine and Jacques Villeneuve � ahead of Badoers accident, Mosley is convinced tolerances are being cut too fine, and something is going to have to be done about it before someone gets seriously hurt.